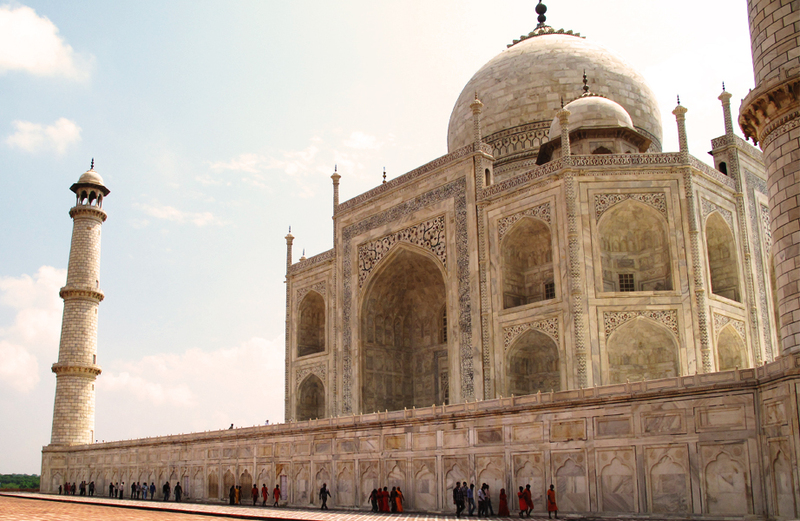 About 120 miles south of Delhi lies the town of Agra and one of the most iconic landmarks in the world, the Taj Mahal. With the new Delhi-Agra expressway due to open up within a week the AIG decided to chance the old road and head for the world heritage site while the journey was still part of the experience. Forty five degree heat (113f), camels, cows, twelve person rickshaws, painted trucks with musical horns and all manner of overloaded vehicles crowd the road, horns blaring, jostling for a gap. Four hours later (yes four) we arrived and quickly moved through the impressive Great Gate with its red stone facade that would alone be a noteworthy monument were it not for the absolute beauty of the landmark it protects. Standing at the end of manicured gardens and reflecting pools the worlds most well known mausoleum is truly breathtaking to view up close. Its white marble shimmers as it reflects the hot sun and its towering minarets dwarf you as you pass into the cool interior. Inside, every surface is ornately carved or adorned with floral inlays of semi precious stones. The Taj is a true work of art, with a magnificence that is impossible to capture in words or pictures. If you are ever in the Agra area or even just near India be sure not to miss this. As for the journey, I would probably try the new expressway. This entry was posted in Places, Travel and tagged Delhi, India, Landmarks, Taj Mahal.